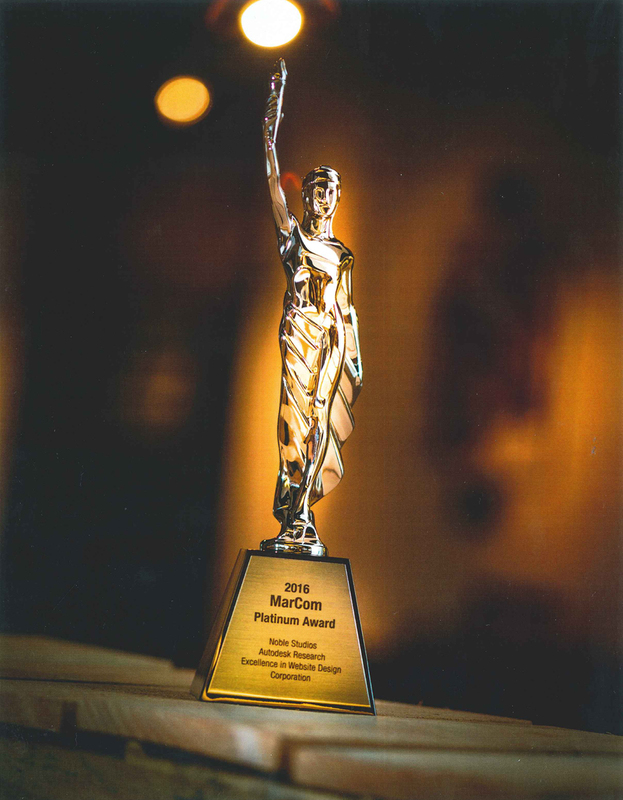 The AutodeskResearch.com website has been recognized with a MarCom Platinum Award of Excellence in Corporate Website Design. The award was presented to Noble Studios, who implemented the Autodesk Research (OCTO) vision in a modern and responsive style. The MarCom Awards is judged by the Association of Marketing and Communication Professionals (AMCP) and is one of the most prestigious international creative competitions. Awards are given for concept, writing, and design of print, visual, audio, web materials, and programs. This year, the AMCP fielded 6,000 entries from 34 countries. This achievement is comparable to winning the Golden Globes in the web design world. AutodeskResearch.com is not only visually appealing, but also an extremely functional collaboration platform driven by a robust infrastructure, which is unique among other R&D sites of large high-tech companies. This platform allows anyone in Autodesk Research to contribute their publications, projects, news, events, conference and partnership information, internship opportunities and blog posts, while fostering a community of editors who help their teammates curate the content. We’re achieving both of our goals to provide a comprehensive open source repository of our research publications and videos, and to engage and communicate with multiple audiences: Autodesk researchers, the scientific community, and a new generation of people interested in popularized and applied science. AutodeskResearch.com helps imagine, design and create a better world, while elevating Autodesk’s profile and reputation in the scientific community by demonstrating thought leadership and showcasing our award winning projects and products. We are very proud of this award; congratulations to everyone who contributed!